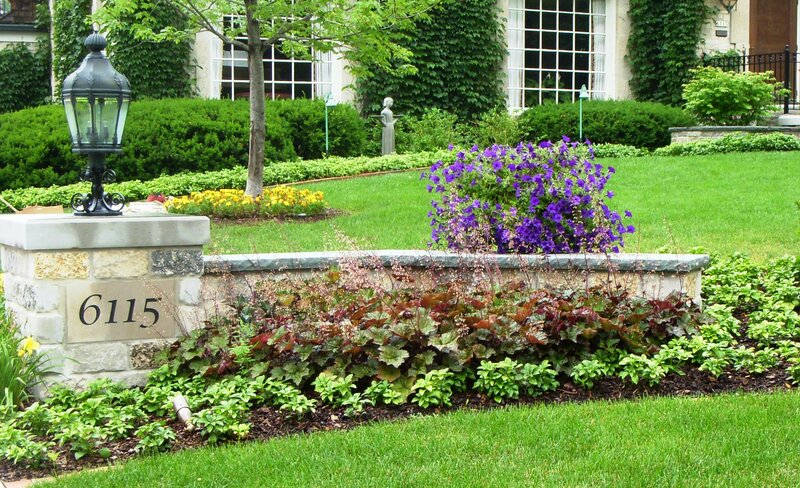 A beautiful stone wall can add a truly majestic element to your landscape. The use of attractive, natural stone in a wall, whether mortared or dry laid, creates an architectural component with a timeless appeal. 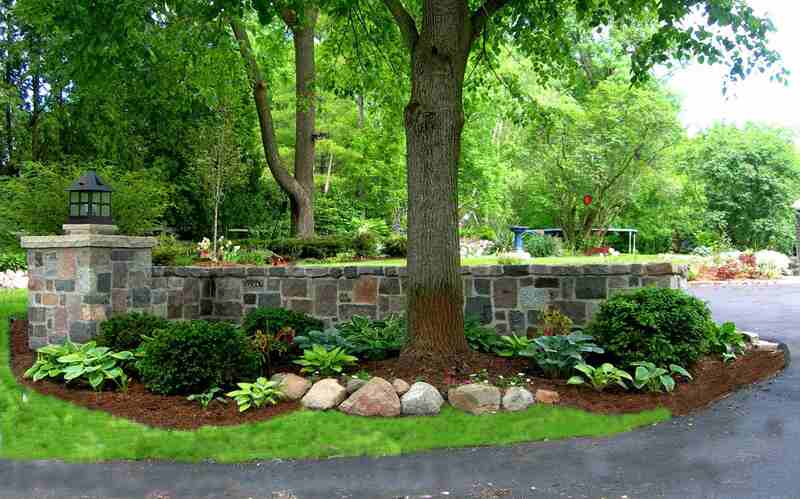 Use a stone wall to enhance the architecture of your home, define space or create a theme for your landscape. A mortared granite wall and column beautifies a driveway entrance and matches the masonry on the house. Frame an entryway, sidewalk or driveway, drawing your eye toward these areas or use as a focal point. Create a sense of space by placing the wall along a sitting area, courtyard or outdoor foyer. Give a sense of privacy by installing a wall around patios and conversational areas. Construct seat walls, providing extra areas to sit and relax, or areas to place planters, garden art, lights, and refreshments. Hold back soil, terracing yards to create usable space and planting areas. There is an infinite selection of natural stone available, split, fractured, cut, tumbled and cobble, that give a variety of architectural effects. Add a column to the end of the wall to help anchor it. For a finished, elegant look, top the wall with a Bluestone or a Bedford limestone cap, or put a marque or address stone in the wall or column. Put landscape lighting on top of the wall column, or have an up light shining onto the wall. 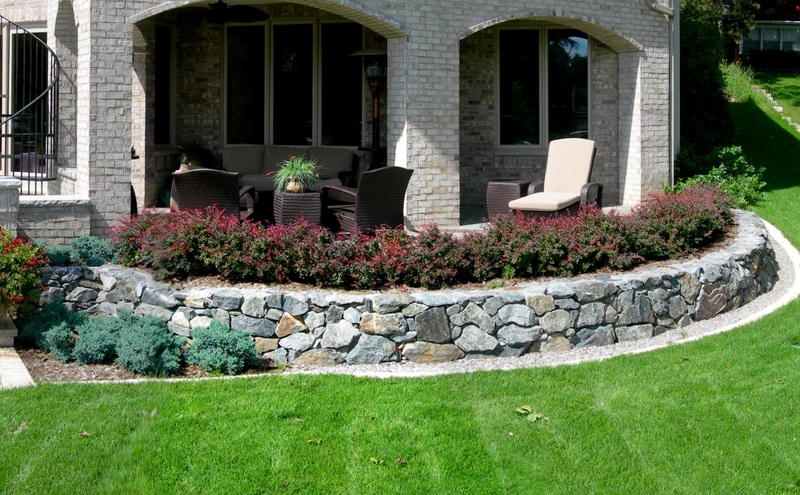 This fractured Basalt wall creates a raised planting bed, giving the sitting area a sense of privacy. This mortared Lannon cobble wall and column with a Bluestone cap helps frame and focalize the entrance. 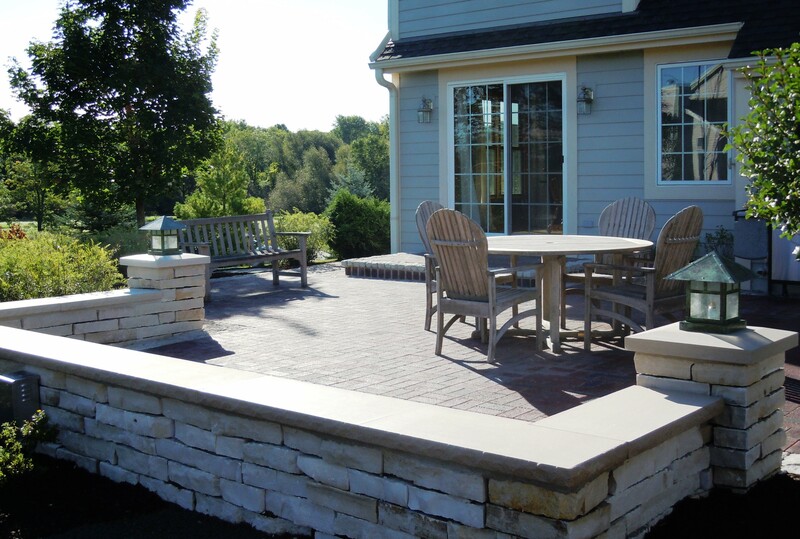 This dry laid Lannon stone wall with a Bedford limestone cap helps give the patio area a sense of privacy.